Go Open Access - What Rights do Scholars and Scientists have? The open access article and the closed access article meet. The closed access article has never heard of the Creative Commons licences under which the open access article has been published, so the open access article has to explain what they are. What is creative commons ? In 2002, the Budapest Open Access Initiative articulated the basic tenets of Open Access for the first time. Since then, thousands of journals have adopted policies that embrace some or all of the Open Access core components related to: readership, reuse, copyright, posting, and machine readability. However, not all Open Access is created equal. For example, a policy that allows anyone to read an article for free six months after its publication is more open than a policy that creates a twelve month embargo; it is also less open than a policy that allows for free reading immediately upon publication. Download the guide: How Open Is It? Assigning your rights matters. Normally, the copyright holder possesses the exclusive rights of reproduction, distribution, public performance, public display, and modiﬁcation of the original work. 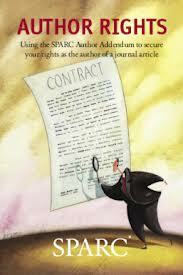 An author who has transferred copyright without retaining these rights must ask permission unless the use is one of the statutory exemptions in copyright law.